As parents, we want to help our kids outgrow us. We want them to be able to stand on their own. We’d also like to enjoy the journey, to have fun with our kids and enjoy spending time with them as we raise them. But we can sabotage our own efforts by overparenting our kids, especially through the teen and young adult years. Join Mighty Parenting podcast hosts Judy Davis and Sandy Fowler as they discuss the impact of overparenting with parent coach Kim Muench. Find out what can happen to our children and our relationship with them. Then, discover powerful parenting strategies that help you stop overparenting and build a strong relationship with your teen. When we parent with our kids rather than over them, we take on the role of being a guide rather than giving a lot of rules and trying to control them. We can give our kids latitude and see where they’re going. If we overparent, we can experience backlash and push back. If we try to control our children through the teen years, we risk our relationship with them. We may force them to pull away so much that they don’t want to be part of our lives at all as they grow up and move out. When parents are over involved in a child’s life then the child doesn’t discover who they really are and they can have trouble launching. Look within and ask yourself what your parent/child relationship is like at this time and identify your greatest challenge. Determine one place where you can begin giving your child space and give them that space. Talk to your child about making this change. Then take your time doing it. Changing too much too soon can lead to risky behavior as they may not yet have the skills to handle that much freedom. You can’t know your child well if you don’t know yourself well. Things may get worse before they get better. 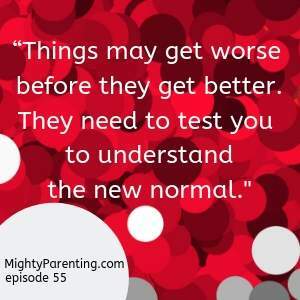 They need to test you to understand the new normal. It’s important to be vulnerable and open with our kids. It’s appropriate to apologize for our mistakes. This is healthy and it models the behavior for our kids. When we parent with our kids, it’s about dialogue and helping them see where we’re coming from. Make short list of what’s most important to you in parenting. What are your core values? What qualities does your child need in the world? What are your boundaries and non-negotiables? Focus on those and let the other things go. If you’ve been on the flip side of this and letting your child rule the roost, have a conversation with them. You could begin it by explaining what’s been going on and how it’s not working for you as a parent. Then share how you are going to change. We need to model self-care and self-compassion. Kim Muench is the mother of five, ages 13-31, and a Jai Institute for Parenting certified parent coach whose favorite population are the parents of preteens and older! Passionate about educating, supporting and encouraging parents, Kim’s personal approach and the one she coaches parents to adopt is a “with” rather than over relationship. Kim guides parents with compassion and without judgment into happier, healthier relationships with their sons and daughters because she is a parent who has been through many challenges in her own journey, including teen pregnancy as well as addiction. 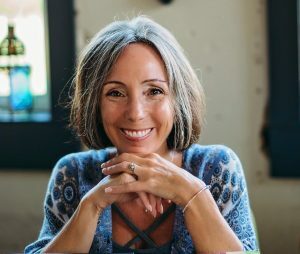 In addition, Kim is a published author who began by writing in 2011 with a memoir entitled My Mothers Footprints: A Story of Faith, Calm, Courage, Patience and Grace. She is currently working on her second book entitled Becoming Me While Raising You, A Mother’s Journey to Self Through Parenting. Kim has been published on sites such as Suburban Parent Magazine (Dallas/Fort Worth), A Fine Parent, The Conscious Parent Blog, The Huffington Post, and she has a newspaper column in her hometown paper. Able to work with parents no matter where they live, Kim enjoys facilitating support groups and workshops for parents of teens in the DFW Metroplex. To learn more or connect with our guest visit www.realifeparentguide.com.